Shopping for the best PTZ web camera for Mac video and voice conferencing? Logitech's BCC950 is a highly affordable, premium quality solution that delivers features most other web cameras for Mac can't. No additional OSX webcam drivers are needed. It handles both PTZ - Pan, Zoom and Tilt camera functions as well as speakerphone/mic capabilities - completely with sophisticated hardware. No other webcam for Mac offers remote control of camera pan / tilt / zoom functionality in such high quality computing hardware. Although some Mac webcam software for image control may allow you to digitally zoom or pan an ordinary webcams image, the Logitech conference cam let you control this via hardware with the tip of your finger - and not by fiddling around with webcam settings control buttons and sliders on your Macintosh desktop or MacBook screen. 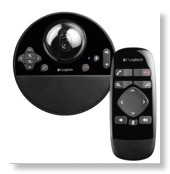 Both the base of the Logitech BCC950 and the optional handheld remote include a simple to use control pad for left and right, up and down, zoom in and out - full webcam control. Going way beyond the simple microphone built into most webcams, the Logitech videoconference cam also includes a full duplex speakerphone. It features both a noise filtering and echo canceling omni-directional microphone for transmitting and receiving crystal-clear speech within the room. Volume up and down and mute controls are also built into the conference cams base as well as the handheld remote. Because the Logitech conference camera is inherently Mac compatible and UVC compliant, you can use it with nearly any OS X video chat program or capture utility. iChat, Apple Messages, Skype for Mac, FaceBook Messaging are but a few popular videoconferencing apps you might use with this state-of-the-art Logitech camera. If desired, you can also use 3rd-party Mac webcam settings utilities for greater degree of image control, camera response and special effects. First and foremost it's UVC USB video class compliant for plug-and-play compatibility with Mac OSx 10.6 or higher. No driver installation is required in OSX, UVC webcam support is built into Apple's operating system. An optical quality Carl Ziess glass lens assures razor sharp images at close range or across the room. It includes an extra long USB cable and power supply cord I for greater freedom of placement on your desk or conference table. It is a USB 2.0 speed device - although it's fully compatible on a Mac with USB 3.0 SuperSpeed ports. The camera has a wide-angle 78° field of view, slightly wider than most personal webcams for multi-person sessions. Logitech's RightLight2 Technology assures excellent light sensitivity and color accuracy. With the street price averaging around $200, Logitech delivers a premium Apple-friendly PTZ web camera with pan tilt and zoom functionality. It's also a high-quality microphone speakerphone with convenient handheld remote to manage a voice conference with ease and professionalism. Having such an affordable Mac compatible video conferencing camera solution can be a money-saving asset for businesses. You can save on travel time and expenses by hosting departmental or client meetings without having to leave the office, fly or drive to get business done. And you can do it without having to spend thousands on a dedicated videoconferencing system. If you're an entrepreneur or sole proprietor the very affordable BCC950 video conference camera can give your Macintosh based business a clear and professional edge to your voice and video calling sessions. Even casual Mac users will love this state-of-the-art Apple compatible PTZ web camera's laser sharp clarity and crystal clear sound quality. Add the advantages of remote control camera control at your fingertips, and you'll experience the most sophisticated Apple friendly video chat sessions you've ever had!